The enticing Greek Island of Santorini is home to the 4-star Alta Mare by Andronis, offering tranquil luxury with only 9 delightful suites, complemented by access to the impressive facilities of the neighbouring Andronis Luxury Suites and the Andronis Boutique Hotel. This means that guests of the Alta Mare by Andronis can enjoy such treats as a spa, organic Mediterranean restaurant and nouvelle-cuisine Greek restaurant. This is all about escaping from the world to a dream-like destination where you can totally relax and unwind, slow down and take life easy. Soak-up the rays at the pool, eat healthily and enjoy an invigorating yet refreshing massage. Book some peace and calm in the warming ambience of Santorini at the 4-star Alta Mare by Andronis, where Greek hospitality is at its finest. 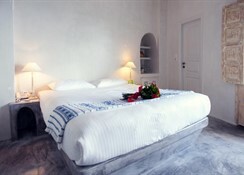 Getting to the hotel: 18km from Santorini International Airport and 20km from Athinios Port. 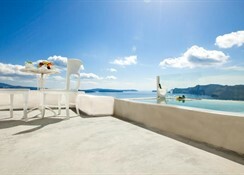 Local tips: The hotel has a cliff top location overlooking the extinct volcano and sparkling Aegean Sea. 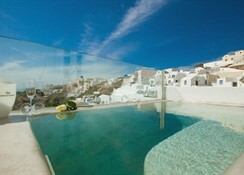 Fira town is 12km away. Food, drink and entertainment: Alta Mare Cafe in the courtyard offers a selection of refreshing salads, gourmet sandwiches and fresh fruit smoothies. Sport, games and activities: Semi-covered outdoor swimming pool, sun terrace with loungers, parasols and towels, a pleasing courtyard, private Jacuzzis on each balcony, spa facilities include body and facial massage and treatments. Wine tours, cultural attractions and fascinating boutiques nearby; access to horse riding, diving and snorkelling. 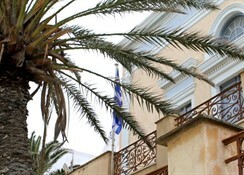 Additional: 24 hour Front Desk services, housekeeping, Concierge desk, free WiFi internet access, laundry & ironing service, information and tourism advice, excursion recommendations, 24 hour business service (fax & copy service), complimentary English & Herald Tribune newspapers, hairdressing service (on request) and experience with private jets-helicopters and limousine services. Guest suites are located on different levels and present clean sophisticated interiors of light pale hues, blending traditional with modernity, drapes and fabrics to add vivid colour, smart furnishings set on cool tiled flooring and amenities for your comfort; features include air-conditioning, private bathroom with hairdryer, bathrobes, slippers and bath amenities, WiFi internet, LCD TV set with satellite & cable channels, DVD player, direct dial telephone, mini fridge and in-room safe box. Superior suites include a comfortable sitting area, a spacious private balcony and Jacuzzi.